Minneapolis, MN (11/11/2008) - It was a weekend about firsts. 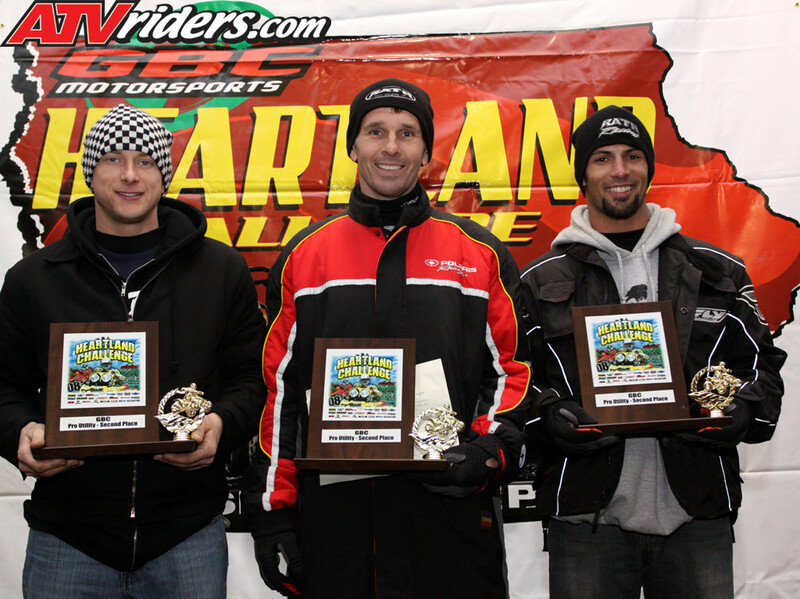 This was the first-annual Heartland Challenge, it was the first time the new Polaris Sportsman 850 XP EPS competed at an AMA /ATVA Sanctioned event, and it was the first time a Polaris 850 XP EPS Sportsman took a podium spot at an AMA/ATVA Event. he GBC Heartland Challenge was going to prove to be a challenge indeed, with temperatures dropping, rain falling and even a few stray snowflakes. This 10-hour ATV endurance race was set up on a brutal course to test rider and machine, mentally, physically and mechanically. Eight miles of mud, hills, trees, rock piles and obstacles, to be ran at a grueling pace for 10 solid hours, no breaks, no rest, no time outs with half the race to be completed in the dark. Calling this race a challenge seemed like an understatement. Saturday’s main event found teams that were formed with two-to-three riders working out the strategic game plans for the day including rider swaps and fuel stops. 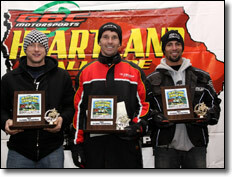 The Polaris/Rath/Dunlop team consisted of Daryl Rath, Frank Batista and Jason Dunkelberger. Daryl Rath was going to take the green flag and clock in the first session. It was shortly after twelve noon when the signal gun was fired and riders made a running sprint to the machines to get this race underway. The pit crew watched anxiously as Rath headed out of sight and into the woods before they headed to their stations to start what would be a long day of watching and waiting. As the race continued the Sportsman 850 XP EPS handled everything and more that the track handled it, and the team found themselves running in a strong second place position. Switching riders throughout the day the team and machines continued to impress the fans, and the team was gaining on first place. It was Batista’s turn to keep pushing forward and that he did, closing the gap even more and then taking over the lead. As he stopped to fuel the excitement in his voice rev’d the team as he announced, “We are leading…come on we are going to do this.” Darkness was coming and it was starting to feel even colder outside, but the team knew there was work to do; they still had four hours to go. The team continued to lead as they clicked off laps and watched the clock. It was time again for Dunkelberger to get back on and go to work. Everyone was excited, the fans braved the cold to cheer the riders on, and watch as the different teams proved what they were made of. It was time for a set-back, Dunkelberger got on the machine and just before he clocked in a complete lap, his machine suffered a small mechanical mishap, a broken belt causing the loss of the entire lap’s time of 23 minutes. Running a flawless race until this lap the Sportsman 850 XP EPS was a fierce competitor in the Utility class. Even after the loss of those precious 23 minutes, there were only two brands left on the lead Utility Lap. With a little more than two hours to go, the team was unable to regain the lead, but accomplished the goals set by themselves and Polaris. 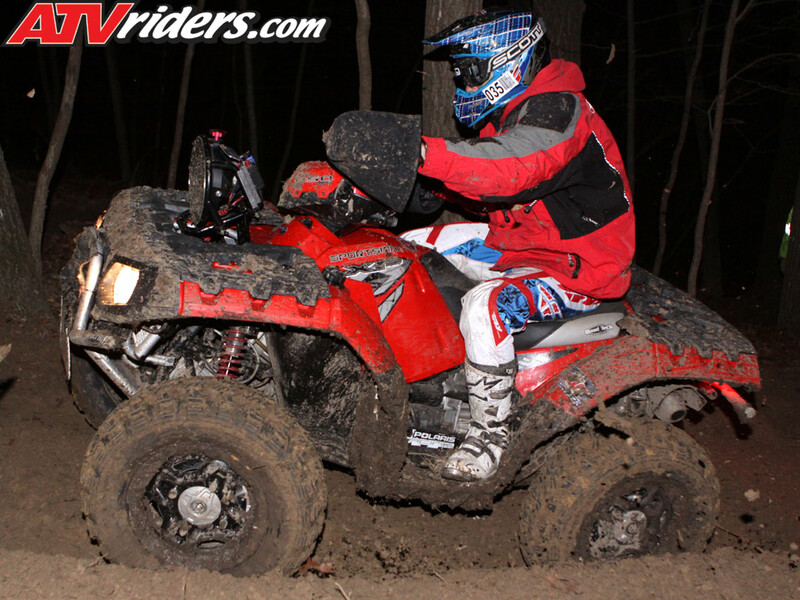 Run a great race, prepare for the 2009 season aboard the newly-appointed contender in the GNCC National Cross Country Utility Class. That they did, with a podium to boot! With annual 2007 sales of $1.8 billion, Polaris designs, engineers, manufactures and markets all-terrain vehicles (ATVs), including the Polaris RANGER(tm), snowmobiles and Victory motorcycles for recreational and utility use. Polaris is a recognized leader in the snowmobile industry, one of the largest manufacturers of all terrain recreational, utility and side-by-side vehicles (ATVs) in the world, and rapidly making impressive in-roads into the motorcycle cruiser and touring marketplace under the Victory(r) brand. The Victory motorcycle division was established in 1998 representing the first all-new American-made motorcycle from a major company in nearly 60 years. 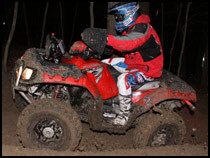 Polaris also enhances the riding experience with a complete line of Pure Polaris apparel, accessories and parts, available at Polaris dealerships. Polaris Industries Inc. trades on the New York Stock Exchange under the symbol "PII," and the Company is included in the S&P Small-Cap 600 stock price index.